Congratulations to Nur Khan from our Student Athlete program for being named November Spotlight Athlete of the Month. We have had the privilege of watching Nur mature as a Student Athlete over the past year. She has become stronger in her Olympic lifts because she is very consistent with showing up. Her attitude is always positive and she encourages her peers to do their best. Nur is very coachable and applies everything Coach Taylor tells her immediately. She truly understands how important nutrition is and the impact it has on your overall health. Here are her responses to the questions asked of the Spotlight Athletes. My parents felt the need for physical activity that would contribute positively to my overall health, in addition to mainstream sports. CrossFit seemed like a perfect fit. My dad recommended CrossFit Fury highly, the first class that I went to was quite challenging, but fun. I realized that if I was consistent the hard work would pay off in the end – and that is what I am trying to do. I now realize more fully the benefit of high intensity exercise after attending classes more regularly. It builds your stamina, core strength and improves mental alertness. The coaches’ emphasis on proper nutrition in addition to the physical regimen has impressed me a lot. Being a healthy eater, the training has actually benefited me more than I was expecting. I have found all the coaches very friendly and inspiring, and this has been a great motivation for me. 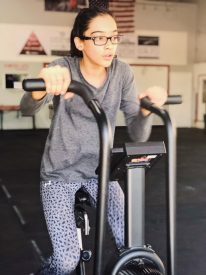 If one is consistent in working out with positive attitude, perseveres and never gives up, with nutrition from healthy home cooked meals, it should be possible for them to fully realize the benefits that Fury has to offer. Congratulations Nur! Keep working hard!